Happy May Day! If you’ve ever worked, this show’s for you. Gerry Tenney – singer, songwriter, guitarist, mandolinist, and stalwart of the Bay Area music scene – celebrates International Worker Day with new and old songs of working people from around the world, backed by the Hard Times Orchestra featuring Rick Elmore on trombone, David Laub on bass, Neil Linden on banjo, Noah and Leslie Tenney on vocals, and Allegra, Suzy, and Eric Thompson on all sorts of instruments and vocals. 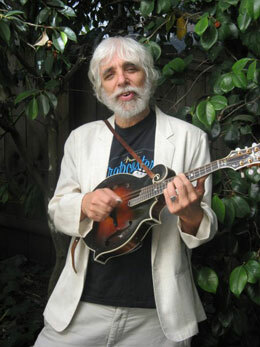 Gerry is the longtime leader of one of the West Coast’s leading klezmer bands, California Klezmer, and also plays with the roots and bluegrass band, the Lost Tribe. This year’s very special guest will be the brilliant monologist, writer, and one man show, Josh Kornbluth, of Red Diaper Baby fame, and many more great films and other projects. He’ll give us the inside scoop on his father’s hootenanny group – is there a dark side? come to the show and find out! – and he’ll also join in on the music. Whether it’s shoveling coal, pushing a broom, or sewing a shirt, workers and their struggles have inspired memorable music for generations. If you dreamed you saw Joe Hill last night, or even if you got no sleep, you won’t want to miss this heartfelt celebration of work, workers, and the struggle for a fair shake!